A quick Launch Pre-fabricated bridge which can be erected within Three to four weeks , shock absorbing safety roller barrier and wire rope safety barrier are the main attractions at the the on going exhibition at the ongoing four day World Road Meet 2017 at Greater Noida. ” Ready to assemble quick launch Acrow bridge is a Two way new generation emergency bridge can be erected with in Three to four weeks and is operational.It has maintenance free life span of more than 80 years .The ACROW parts are fabricated with superior steel. They are designed better for heavier contemporary traffic loads to meet National Highway specifications of two lane and three lane bridges. It is suitable for hills of Himachal, Uttarakhand Jammu and Kashmir and North East and ” said Lt gen S Ravi Shankar (retd) explaining about the bridge . 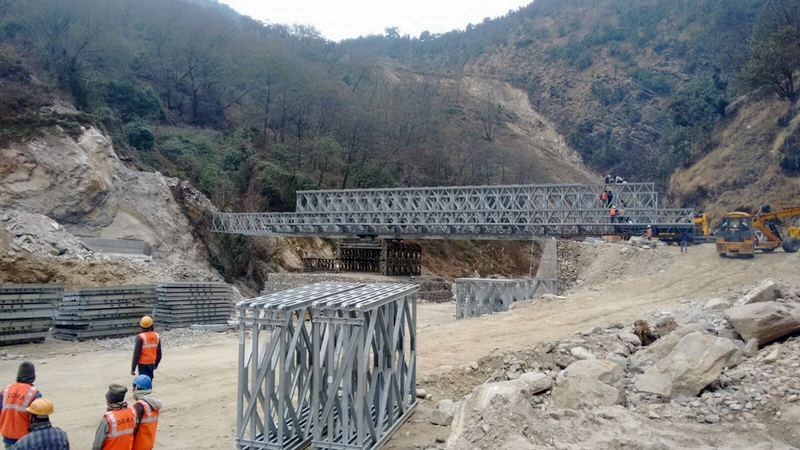 ” The first Acrow Bridge has been installed for Chardham Yatra pilgrims Visiting Kedarnath Dham for easy access to the Kedarnath Temple as the Bridge at Sonprayag enroute to Kedarnath, washed away twice in the last few years, has now found a more permanent solution with the construction of two way ACROW , the new generation emergency bridge. The bridge constructed on Mandakini river between Sonprayag and Gaurikund was completed in record time of 30 days by US based bridge company Acrow with the World Bank funding.The bridge was launched in thirty days. The restricted space, inclement weather and terrain added to the time. On a simpler site, it could have been managed in two weeks. The bridge is bit costly but The speed of launch more than compensates the cost when compared to other conventional options for permanent bridges. 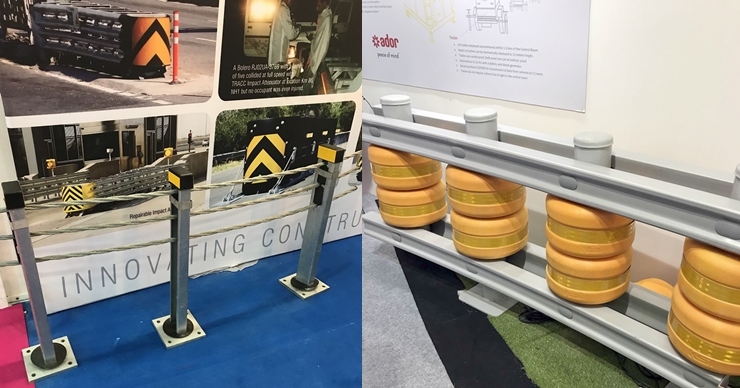 The other highlight of the exhibition on road safety are the new generation road crash barriers including shock breaking roller system which helps the crashing vehicle to decrease speed as well as redirecting the vehicle saving major damage to occupants and the vehicle. This is costly but life saving new technology barriers.similarly instead of metal beam barriers currently used in India high performance wire rope safety barrier have also been displayed,use Crash barriers or Traffic Safety Barriers are provided on roads/ highways with a basic intent to safely redirect an erring vehicle that has lost control and veered off the carriage way and bringing it back on the carriageway of these rope barriers has become mandatory in India for highways and have been installed on major highways across India.